Author(s): Ravi P. Tripathi, Department of Physics, St. Andrew’s college, Gorakhpur, U.P. 273001,, India	Mohammad Zulfequar, Shamshad A. Khan. Background: The study of chalcogenide at nano scale have great importance for understanding electrical, optical and structural properties because they having wide range of application for fundamental and technological studies. Objective: The aim of present work is to study the structural, optical and electrical properties of Se85In9Bi6 nano-chalcogenide thin films. Method: Melt-quenching technique was applied for bulk alloy preparation. The DSC and XRD measurements were done to confirm the nature of the alloy. PVCT had been used for the deposition of thin films of different thickness. FESEM and HRTEM were used to study the particle size and surface morphology. The optical studies were done by a computerized JASCO spectrophotometer and dcconductivity measurement was done under high vacuum. Results: The HRTEM and FESEM images show that the thin films contains high yield of nonoparticles. The absorption coefficient (α) and extinction coefficient (k) both increases as photon energy increase but both decreases as thickness increases. The optical absorption follows the rule of indirect transition and its value increases from 1.36 to 1.49 eV as the thickness increases from 20 to 80 nm. The dc conductivity increases as the temperature increases and activation energy increases as thickness increases. 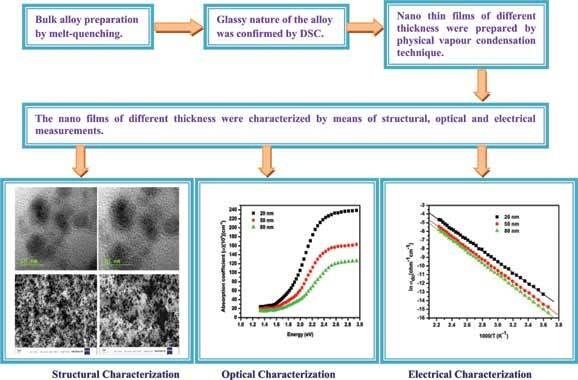 Conclusion: From the study of structural, electrical and optical characteristics of the Se85In9Bi6 nano chalcogenide thin films we found that due to change in thickness different parameters changes and we can say that our prepared sample has possible application for different devices. Keywords: Nanochalcogenide, absorption coefficient, extinction coefficient, optical band gap, DC conductivity, activation energy. Keywords:Nanochalcogenide, absorption coefficient, extinction coefficient, optical band gap, DC conductivity, activation energy. Abstract:Background: The study of chalcogenide at nano scale have great importance for understanding electrical, optical and structural properties because they having wide range of application for fundamental and technological studies.